In the last few years handlebar moustaches have increased in popularity. Handlebar moustaches are small and thick and have small points at each end. If you were wondering, yes handlebar moustaches are named after the handlebars on a bike as they point upwards at each end. The Salvador Dali moustache is named after the surrealist painter who popularised this particular style of moustache. If you’re unsure of what the Salvador Dali moustache looks like, it is an incredibly thin moustache which features long, pointy ends that point upwards. Typically men who opt to sport a Salvador Dali style moustache will opt to shave the corner of their mouths, just as Dali did. The English moustache is one of the most common moustache styles and features long whiskers which are pulled to each side. The English moustache is fuller in the centre of the mouth and gets slightly thinner at its ends. The horseshoe moustache does indeed resemble the shape of a horseshoe and is the type of moustache which the classic wrestler Hulk Hogan sported during his career as a professional wrestler. The Fu Manchu moustache is rather unique and it points downwards and hangs lower than a man’s chin. If you’re curious this particular moustache was not named after a real life individual and is named after a fictional character. Although the Fu Manchu moustache is thought to have originated from China. If you’re looking for an easy to maintain, small moustache that’s not too loud or in your face, your idol moustache may be the lampshade. 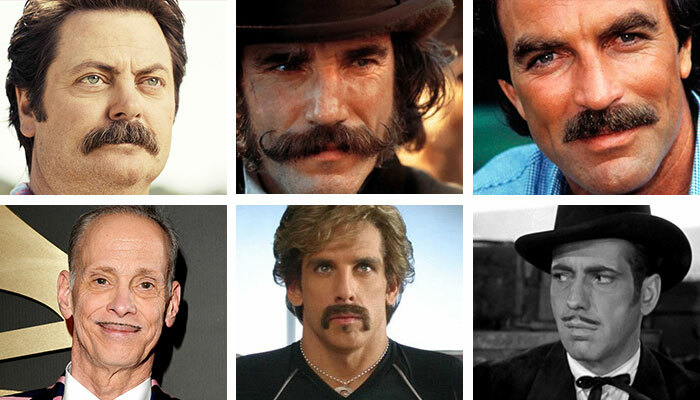 Which is closely cropped and sits directly above your upper lip. In order to create a lampshade moustache make sure that your new moustache matches the length of your upper lip. As a lampshade moustache should be no longer or no shorter than your upper lip. The Painters Brush can be seen on the movie character Ron Burgundy from the film Anchorman and is a medium sized moustache which looks a little bit like a paintbrush and which has corners which are rounded instead of pointy, like many moustaches are. While in the 1920s pencil moustaches were incredibly popular, in recent years pencil moustaches have started to lose favor with contemporary men who tend to favor thicker moustaches. The pencil moustache, as its name suggests is an incredibly thin moustache, that looks like it has been drawn with a pencil. Typically men who opt to shape a pencil moustache will leave a wide gap between their nose and their moustache. If you’re trying to picture a pencil moustache, think of Gomez’ moustache from The Addams Family! So if you’re looking for a new moustache stylet to try out, you have 8 fun options to choose from. Hey I’m Richard, the editor of Nation Trendz. With the virtual office increasingly becoming popular with many Kiwis, businesses are moving away from conventional leasing to this more affordable platform. While there will always be a place for the . . .
Have you just bought a motorcycle and cannot wait to customize and transform it into your dream bike? Getting a new bike is an adventure for most riders. Motorcycles can be modified in endless ways. . . .
Having a flat belly is something you can be proud of. It shows that you have been working hard to maintain your fitness while watching the kind of meals you eat. Exercising to lose belly fat will also . . . If you have an edgy, slightly alternative style and are looking for new, unique ways to stand out from the crowd and to express yourself, simply continue reading to discover a list of quirky, unique . . .